It was a fine piece of advertising copywriting. "Get Ahead. Get A Hat", was the punchy slogan from the late Fifties. The phrase came from a poster pasted up in every London Underground station encouraging men to wear more hats. But sadly it was too late. The hatters were in a dying trade and they knew it. No more would the sky be black with titters tossed in the air when the Derby winner romped home. The city gent in his bowler. the teacher's mortarboard. even the reporter's slouch hat with press card was a disappearing sight. But now, in a bareheaded new century. one hat is surviving and prospering. One hat alone remains a style statement for the sophisticated rebel — the fedora. There was much joy in style. conscious circles when a few days ago, chef Marco Pierre White — self-confessed "bad boy of the kitchen" was pictured outside the High Court wearing a fedora. Over the years, this hat has been the perfect sartorial accompaniment to Tommy gun and saxophone. It has a cheek when pushed back with the forefinger and a charm when worn to one side. It is a devil-may-care hat for dangerous men. The soft felt hat with its central pinch and soap brim took its name from Princess Fedora Romanoff, a character in a Victorian melodrama written by the French dramatist Vittorien Sardou for Sarah Bernhardt and first performed in Paris in 1883. It set the trend for women to start wearing them. Men rapidly followed suit. According to Janet Taylor. marketing director of James Lock & Co. the St James's Street hatters. the fedora has now' taken over as the business hat. "It has replaced the bowler," she said. "It is more popular than the trilby, which hasn't got the drama. The fedora has a tough yet artistic image." It was Lock & Co that provided the hat for Marco Pierre White. It was the £135 Louisiana, as it is called. which was popularised during the jazz era in the US. But I wonder whether he should have been wearing the hat after all. Marco was awarded £75.000 by the court against The New York Times and The International Herald Tribune after they claimed erroneously that he went on a "well-publicised bout of drugs and alcohol". Marco said he rarely drank and objected to drugs and so had been damaged by the article. The jury agreed. These are commendable attributes in the flamboyant chef But they are not the best qualifications for wearing a fedora. It is said about those who wear a fedora that it is "a soft felt fora hard man". I wonder how the Mafia wise guys and the cool dudes in Hollywood are going to take to a non-drinking, clean-living. London cook, whose only sin is to shout in the kitchen, wearing their hat? APA 6th ed. : Edwards, Adam (2000-04-15). F — you're fedorable. The Daily Telegraph p. 8. MLA 7th ed. : Edwards, Adam. 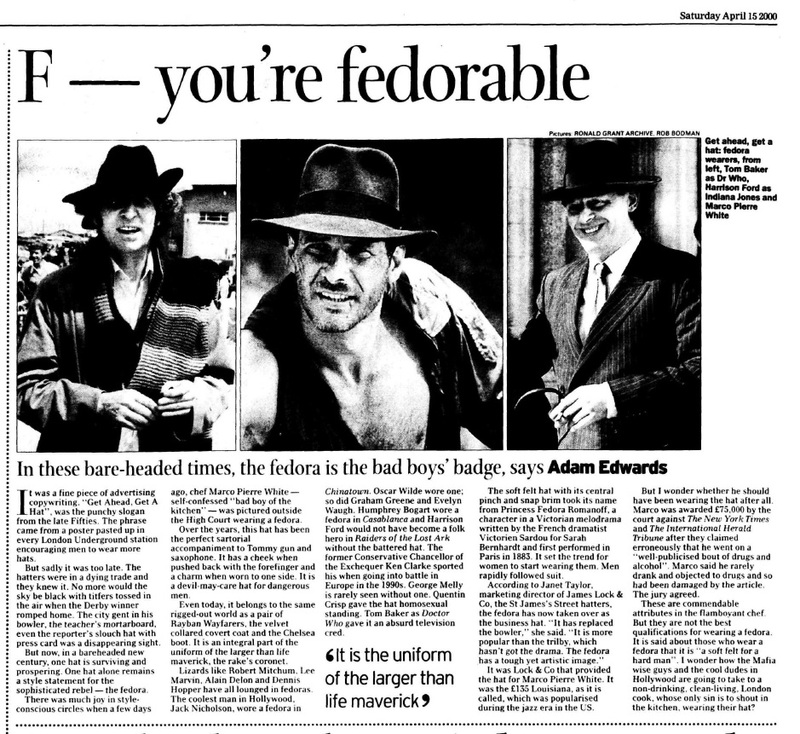 "F — you're fedorable." The Daily Telegraph [add city] 2000-04-15, 8. Print. Turabian: Edwards, Adam. "F — you're fedorable." The Daily Telegraph, 2000-04-15, section, 8 edition. This page was last modified on 30 October 2017, at 23:18.